A lovely part of the world, Mt Eliza. 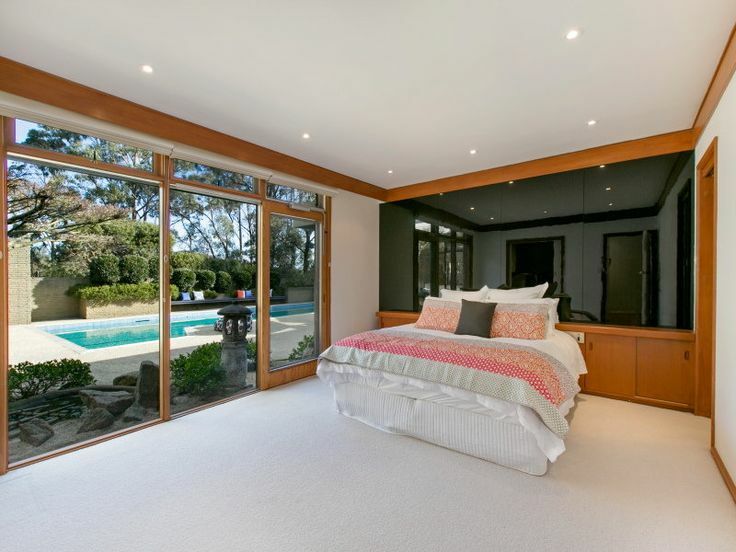 Easily accessible down the highway (or freeway) from Melbourne but just far enough away to contain some great bush garden properties such as this one. Mt Eliza has a great history too, as part of it was designed by Walter Burley and Marion Mahony Griffin (of designing Canberra fame). Those who have experienced the circular roads of our nation’s capital would recognise some of those same elements in the sweeping drives of this unique suburb. 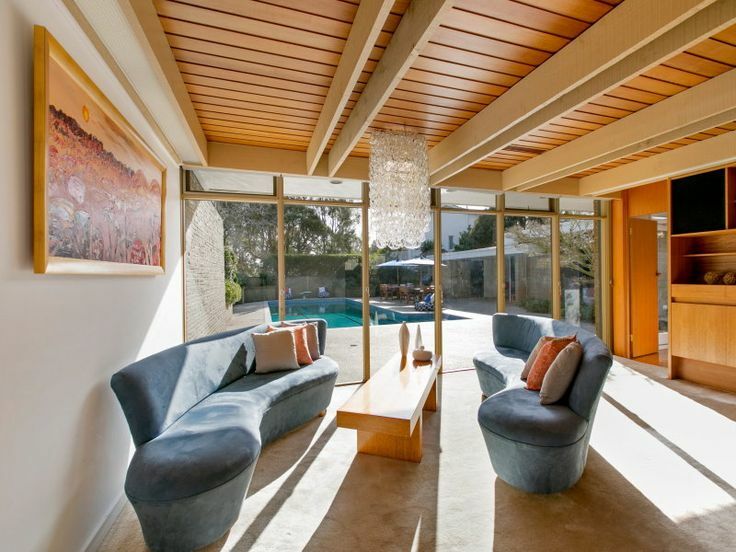 This area of the Mornington Peninsula is also home to some great mid-century homes and features architecture from the likes of Robin Boyd, Chancellor & Patrick, Graeme Gunn and more. 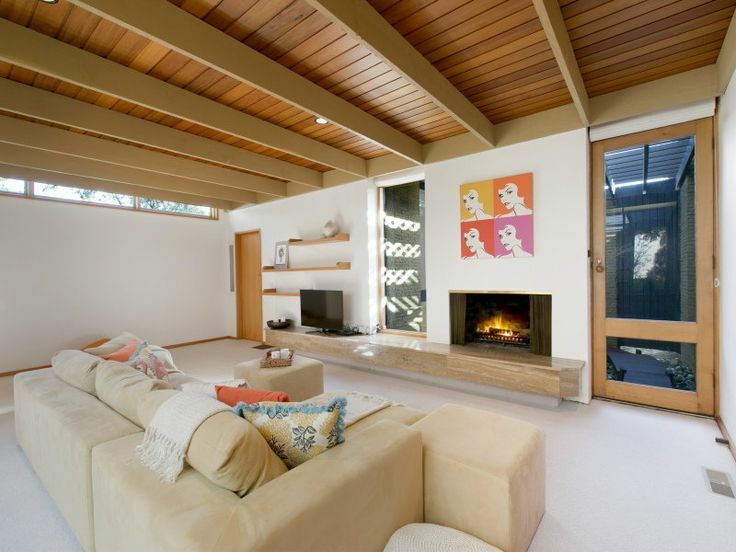 This home has grabbed some attention on various mid-century realestate pages and while it has been updated internally it still retains plenty of modernist character. 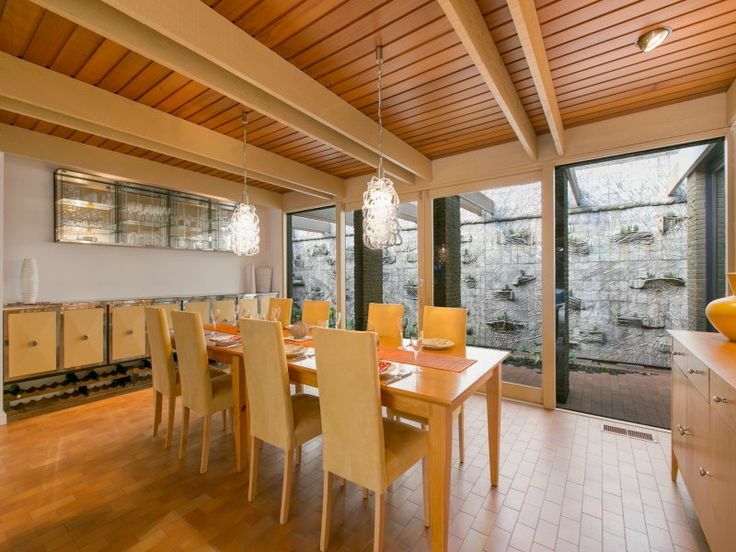 You can see from the listing that the agents have embraced the mid-century appeal with plenty of Mad Men puns and even a sophisticated cocktail party to display the entertaining opportunities! 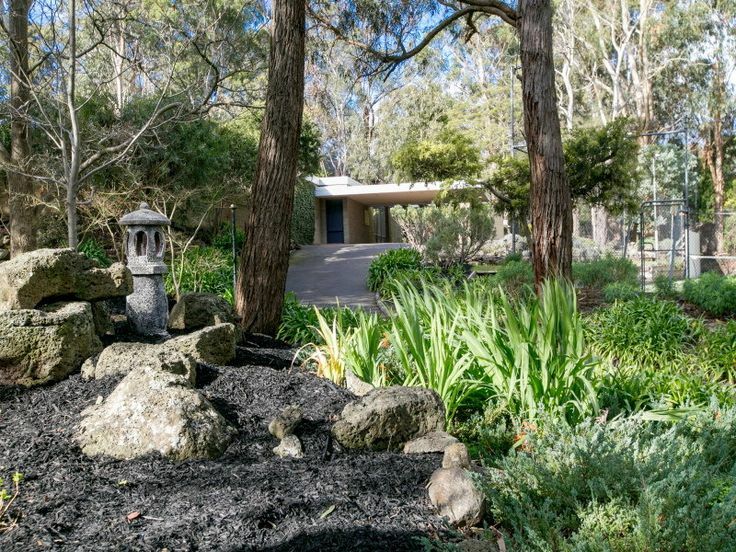 Set within a stunning backdrop of Eucalypts, this home and garden exhibits a wonderful bush garden character. There are even hints of Japanese garden inspiration with a stone lantern and feature rocks. All of this appears to blend well and complement the external architecture of the house. 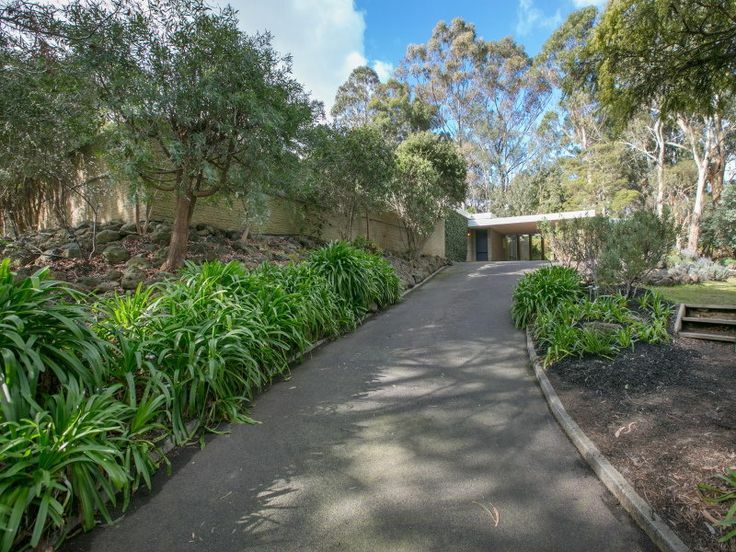 The view up the driveway slowly reveals the house behind native trees and rock gardens. If only someone were to replace the Agapanthus (yes I know it is hardy, but it is a noxious weed) with some mass planted rows of Dianella (Native Flax) or Lomandra (Matt Rush). What has really appealed to me is that all of the internal photos feature rooms with access to and views of courtyards. The floor plan shows that each bedroom and living space does indeed have a courtyard or atrium connected to it which creates a wonderfully secluded indoor/outdoor link throughout the home. The main living area is connected to a stunning paved courtyard which is bordered by a sculptural wall. I have never heard of Rudolph Dybka before, however this work has been accredited to him and is a standout feature. 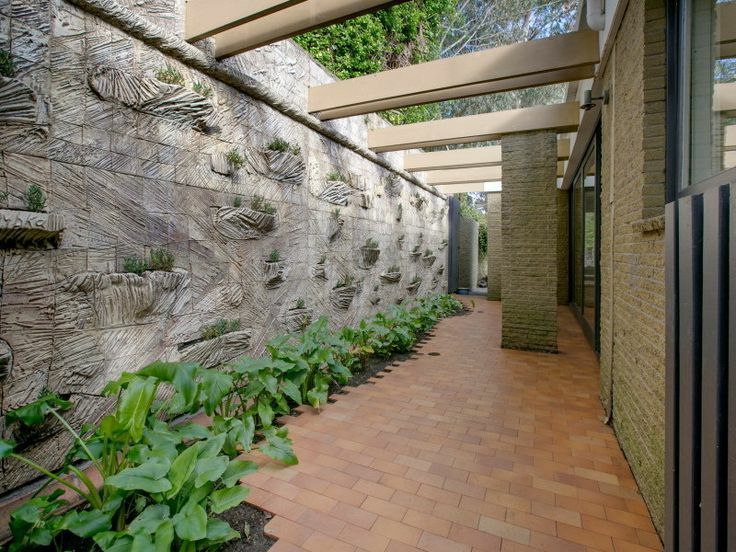 The wall has a brutalist feel to it but is also quite organic with sculpted niches for plants and texture that is reminiscent of rock strata or maybe even a machine carved mineshaft. The ceiling beams continue from inside the dining room and enclose the courtyard, linking the wall to the internal space. The other main garden space is the swimming pool area, which can be viewed from the master bedroom, formal living room and kitchen. The pool deck is minimal in its landscaping apart from a small Japanese inspired pond and rock garden just outside the master bedroom. 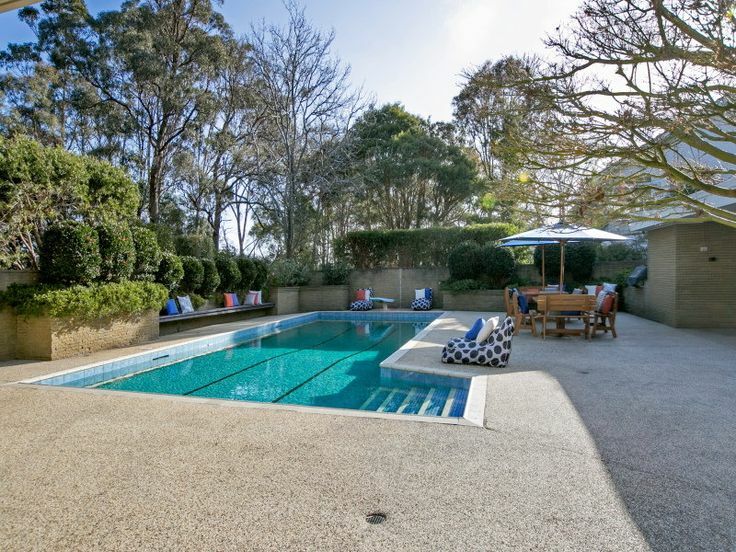 A formal swimming pool is surrounded by pebble-crete pavement (a great non-slip surface) and garden walls and planters separate the area from the rest of the garden. One ornamental tree provides contrast to the solid forms of the house and pavement. In this location a Japanese Maple would be perfect for its seasonal colour change and ornate foliage. The swimming pool is fully tiled which offsets the neutral colours of the house and pavement and even comes with lane markers for that late night race (maybe to settle a wager). 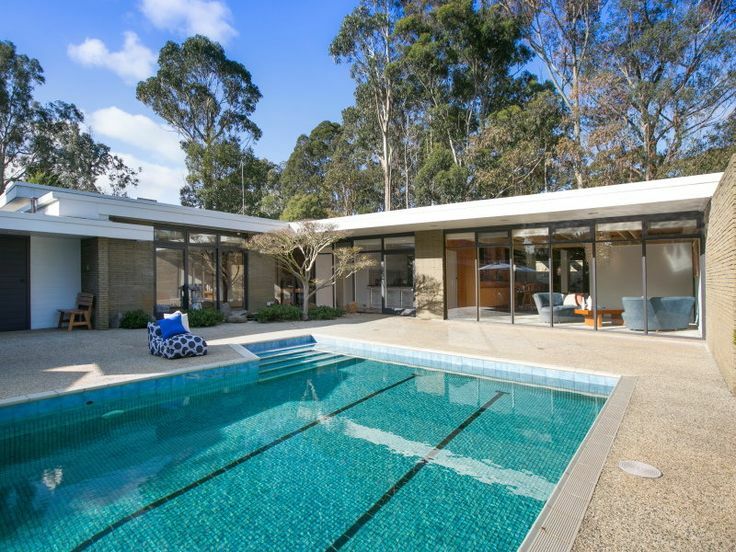 The courtyards and seclusion of the pool area work wonderfully with the backdrop of gum trees and the architecture of the house. There is also a tennis court, however that’s not where the real modernist appeal lies. Outstanding! If I were in Melbourne I’d have to tamp down the urge to be an annoying lookie-loo and crash some open houses. I am sure that agents are used to many a ‘tyre-kicker’ having a sneaky look through. They should realise that the more people that have a look, the more there are to spread the word! I notice that they are requesting ID from those inspecting. Is that supposed to scare away sticky beaks? Whaaaat, like photo ID? “Okay, here’s my Tasmanian license, bye.” I know it’s a waste of time when people show up just to have a gawk but it’s not like they can blacklist anybody at the door, haha. 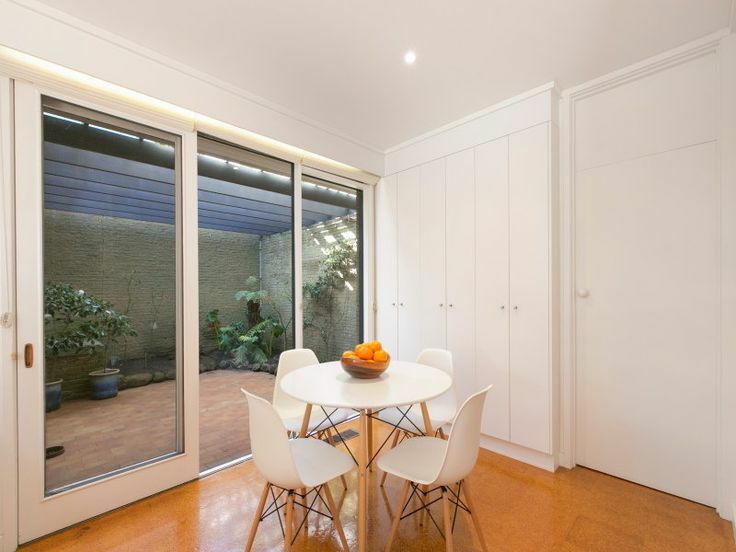 And blog posts like these are excellent free advertising for realtors as well as a useful look into Australian MCM design.